Famous American comedian, W.C Fields said, Never work with animals or children, but he’d never been to Papua New Guinea and seen the kids participating in the Goroka Show. Fields’ theory was that kids (and animals) are erratic and unpredictable. Duh! Of course, they are. But they are also stars in Papua New Guinea. 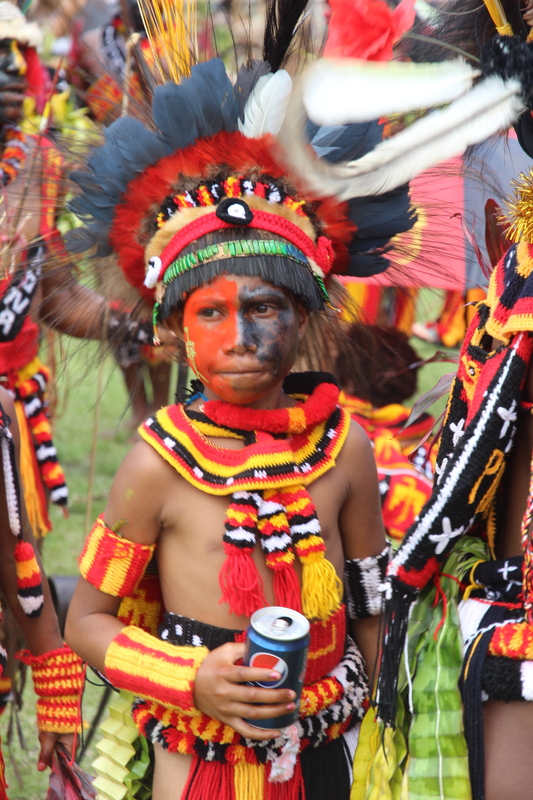 I was so pleased to see so many children being involved in the groups performing at the annual Goroka Show. Almost every group had at least one child involved, and many had six or seven. Their costumes were almost as elaborate as any adult’s costume (these get-ups are developed over years, so it’s not surprisingly that ones for kids lag behind). 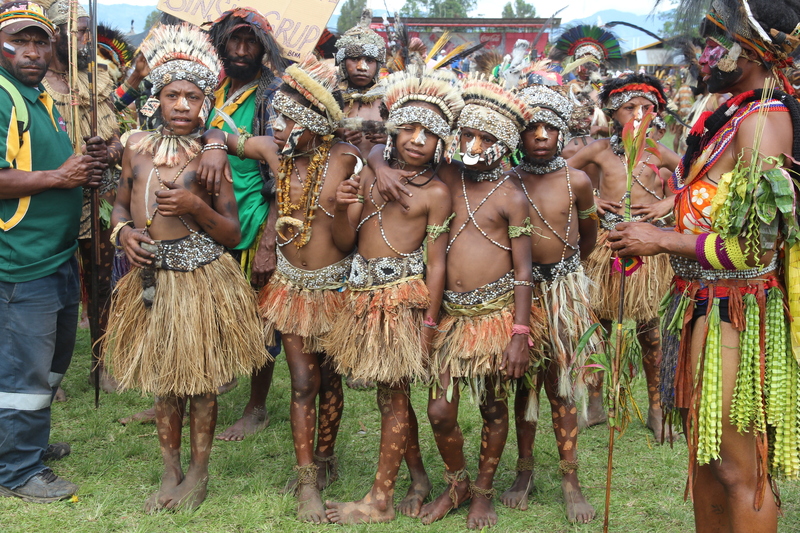 The Goroka show has been going for almost 60 years, and I’m hopeful that will go on for at least another 60. And that’s simply because the young’uns are being taught about the costumes, songs, dances, chats, drumming and patience. I think their patience impressed me most. Many performed from morn until late afternoon on both days. Thousands of people watched them with a careful eye, and photographed them until the camera clicks must have driven them crazy. But in all that time, I did not hear one child crack an emotion (throw a tantrum), raise their voice, throw a swing or behave badly. Kids don’t have to be monsters or run the show. This article has some great advice. P.S. I think the boy in the pic below is part of the same tribe as Mr Grumpy pictured at the top of my previous blog post. Leggy Peggy – I’m so delighted you subscribed to my blog so I could FIND YOURS! Specutacular photos and such a wonderful glimpse into the wondrous world we all share. Thanks so much. I love your blog too. Thanks for sharing your impressions and wonderful photos, Thanks a lot for the interesting article; I wish many parents would read this! Yes, I thought the article was excellent. Kids are terrific! I sure hope their nice looks stay with them rather than like their elders! Ha ha ha!